Along with my travel buddies and new recruits, we finally set foot in Siargao in November 2009, more than two years after "siargao daw". A series of typhoon came a week before our trip. Luckily when the day came, the skies began to clear up. Thank God for sunny days. 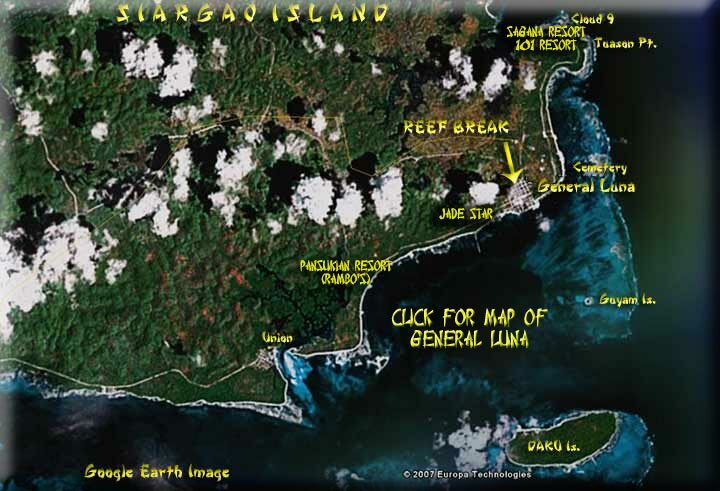 With a charm of its own, Siargao has remained rustic and provincial inspite of the increasing number of tourist coming in. Probably, the influx is still not enough, peak surfing season does not last longer than three months and there seemed to be no other sustainable development in the area. Cebu Pacific fly MON/FRI departing CEBU at 10:40am and returning from SIARGAO at 11:50am. There are connecting Cebu Pacific flights from MANILA so please check website for further details on departure times from Manila to connect with the CEBU flight to SIARGAO. You can purchase e-tickets on-line. Be aware there is a check-in luggage limit of 15kg for this flight and excess luggage is charged at PHP100/kg. If you are bringing surfboards you need to check the box for Sport Equipment and pay an extra PHP1,000 each way. Cebu Pacific have flights from Manila via Cebu to Siargao island on MON & FRI as per above and this is the easiest way to get to the island. You will have a transit time in Cebu but can request for your baggage to be checked all the way through to Siargao. Air Phil Express fly daily from MANILA to SURIGAO City and you can book online through www.philippineairlines.com Flights currently depart at 09:40am from Manila and 11:20am from Surigao City. It's a tight connection to make the last ferry that departs Surigao pier at 12 noon to Siargao island so if you miss the boat you will either have to stay overnight in Surigao or we can assist with organising a private pump boat to bring you to the island. There is also the overnight boat option from Cebu to Surigao City with Cokaliong Shipping Lines. The ferry departs Cebu at 7pm daily except for Sundays. From Surigao City to Cebu there is no ferry on Mondays. Van transfer from Sayak airport on Siargao to Cloud 9 takes about 45 minutes. Van transfer from Dapa pier on Siargao to Cloud 9 takes about 30 minutes. If you wish to do nothing else but surf, you can stay along the shore of Cloud 9. However, we opted to stay in General Luna since most restaurants are here. 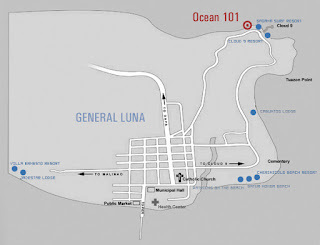 General Luna is about 10 minutes away by motorbike to Cloud 9. We opted to take the flight from Mactan, Cebu to Sayak Airport, Siargao on Cebu Pacific, booking way ahead to avail of promo fares. Cebu Pacific closes it's check-in counter exactly 45 minutes before flight schedule, but we arrived a little late. Good thing, we had companions who arrived ahead and checked-in ahead on our behalf. It was a forty-minute flight, further shorten by the in-flight games. We arrived Sayak Airport on a bright sunny day. The airport is quite small with no frills. Turn around flight has left even before we could claim our check-in luggage. Transportation at the airport is limited to habal-habal (motorcycle) or when you're lucky, there are vans on standby. We were met by Cherinicole Resort where we will be checking-in for three nights on board a multi-cab. We were all surprised to see the multicab, it was an open trunk mini truck, we were expecting a jeepney-like one. Who would want to ride that under the blazing sun after the typhoon? In a flash, everyone pulled out their spf 70+ sunblock. Later, we were able to negotiate to rent the van parked next to it instead. That would have roast us on our first hour in Siargao. The airport is in Sayak, an hour away from the world famous surfing spot, Cloud 9. From the airport, you pass by the town of Dapa where the central market is. 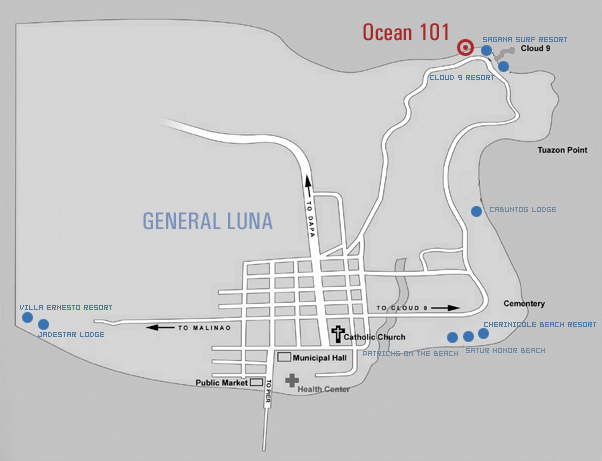 Then proceed to General Luna where most of the resorts are, this is about 10 minutes motorbike ride to the Cloud 9. Half way from Sayak Airport to Dapa, Siargao, we had lunch at MEMS, the so called classiest restaurant in Dapa, Siargao. The food was average. After buying enough supply of drinking water, we checked-in in Cherinicole Resort. The cottage rooms were spacious with basic amenities. In the afternoon, we went island hopping at Naked Island and spent the rest of the time in Daku Island while waiting for the sunset. Barbecue dinner at Arnaldo's was great, I lost count how many pork barbecue sticks I consumed. Before dozing off, we went to Nine Bar for a drink... mango shake again! We were awakened with Brooke's (the caretaker named Ronnie aka Brooke Shields) morning call... if only I could appropriately mimic and describe how he/she says "knock-knock". Complimentary breakfast was bread, egg and coffee. It's definitely not enough to pull us through a surfing day. So we stuffed ourselves with a hearty breakfast on tocino and corned beef with rice. Eating canned goods have become a luxury to a person whose household is banned from buying preserved goods. Every vacation is a good opportunity for me to indulge on those so called bad food. We booked surfing instructors through the resort staff. For P500/hr, it includes surfing board rental and one on one surfing lessons. Aboard the habal-habal, we went for a 15 minute ride to Cloud 9 enroute unpaved road. A wooden walkway from the shore leads you to the world famous surf breaks of Cloud 9. International Surfing competition is held here, the grandest held every August where the amihan wind is just perfect. Just a few meters from Cloud 9, beginners like us, were led to Jacking Horse, where wave jacks up and hits the reef with a fair bit of vengeance. We had a short briefing on shore, teaching us the right footwork how to stand up on the board. That was it and we're off to sea. For the next hour, I was struggling to get myself up on my wobbly board. I almost gave up after exerting too much effort than usual, resulting to cramps on the abs and foot. Nevertheless surfing was fun with great company. All it took was to swap boards, weeee! Bigger boards made surfing so easy, I was effortlessly standing on the board over and over again. By the way, the instructor did all the paddling for me, that saved a lot of energy! One companion remained the ultimate sports fan and opted to stay on shore, in fairness, she did a good job on sports photography with a zoom lens. After surfing, we went back to the resort for lunch. We had them cook crabs bought from the market. Siargao/Surigao is famous for their sweet jumbo crabs. The rest of the day was spent beach bumming at Guyam Island until the sun set. Dinner at Patrick's on the Beach was great. It was the boys' turn to order for the group, they did a pretty good job. 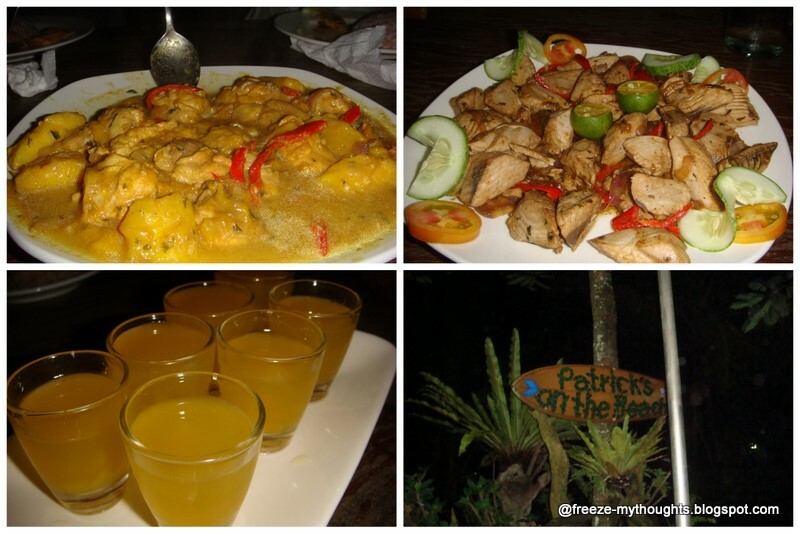 The chicken mango curry was a hit and so was the grilled fish fillet and the yohoho mango rum was the star of the night. Us girls doze off early, while the guys went Wild wild west at Nine Bar for booze. Our companions went on an early morning mass cramping on a small bench with the locals. The resort representatives later explained that locals sat in church by barrio, so each has a designated seat to sit on. No wonder the locals kept cramping on that bench even there are other vacant ones, they sat on their permanent seats! We jumped off Magkukuob cave. It was the worst landing I ever had, ouch!!! Too bad, it was not stingless jellyfish season, contrary to our advance inquiry. We saw the lone survivor of the stingless jellyfish on our way back to the tourist center. I was quite upset since it didn't meet my expectation, reviews are just fantastic, maybe it was not such a good season to visit. Weather is crucial when cruising to Socorro, the sea could be really rough, the waves were even big on a bright sunny day. It was another 2-hour long ride back to General Luna, Siargao. The boatman lost his patience with his so called demanding guests, oops! Capped the day with belly aching laughs at Jabines Payag Cafe. 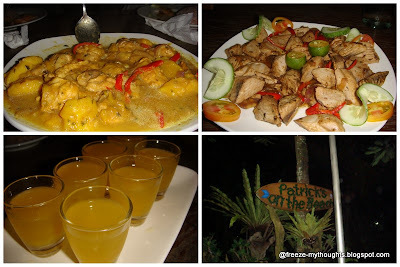 We had to go back to Patrick's at the Beach for another round of Yohoho Mango Rum, after two long necks, we tricked the boys to order breakfast for everyone, for a change.